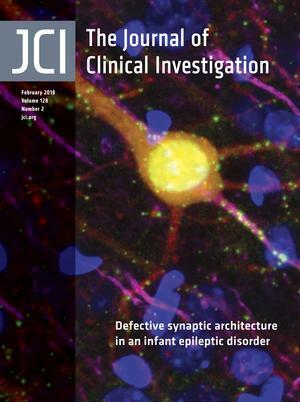 This month’s cover features a cortical pyramidal neuron, distinguishable by its yellow nucleus. The interaction of FingR-gephyrin (green) and ankyrin (magenta) at the axion initial segment helps to stabilize inhibitory synapse organization. The cell is filled with red fluorescent protein for visualization. The corresponding study by Wang et al. describes the defective neuronal morphology, synaptogenesis, and inhibitory signaling that underlie early infantile epileptic encephalography 5, a disease linked to mutations in αII spectrin. Image credit: Yu Wang. Citation Information: J Clin Invest. 2018;128(2):564-566. https://doi.org/10.1172/JCI98761. Citation Information: J Clin Invest. 2018;128(2):567-569. https://doi.org/10.1172/JCI99037. Hepatic glucose production (HGP) is a key determinant of glucose homeostasis. Glucagon binding to its cognate seven-transmembrane Gs-coupled receptor in hepatocytes stimulates cAMP production, resulting in increased HGP. In this issue of the JCI, Rossi and colleagues tested the hypothesis that activation of hepatic Gi–coupled receptors, which should inhibit cAMP production, would oppose the cAMP-inducing action of glucagon and thereby decrease HGP. Surprisingly, however, the opposite occurred: activation of Gi signaling increased HGP via a novel mechanism, while inhibition of Gi signaling reduced HGP. These results define a new physiologic role for hepatic Gi signaling and identify a potential therapeutic target for HGP regulation. Citation Information: J Clin Invest. 2018;128(2):570-572. https://doi.org/10.1172/JCI99047. Citation Information: J Clin Invest. 2018;128(2):573-576. https://doi.org/10.1172/JCI99035. Hepatitis B virus (HBV) infection can be managed clinically with nucleos(t)ide therapy, which suppresses viral replication; however, these drugs must often be used long term, as they are unable to fully eliminate the virus. For many patients, discontinuation of treatment results in viral resurgence and hepatic flare, and there is not a reliable way to identify those individuals that can be successfully taken off nucleos(t)ide therapy. In this issue of the JCI, Rivino and colleagues report on their use of a multipronged approach to investigate potential biomarkers indicative of HBV-infected patients who can safely stop nucleos(t)ide therapy. The authors identified a population of HBV-specific, PD1-positive T cells that was present in HBV-infected patients who successfully discontinued treatment without hepatic flare, but not in those that developed flare upon treatment cessation. Together, these results support the concept that PD1+ cells may play an important role in viral control, the further evaluation of this T cell subset in preventing hepatic flare, and the development of assays to better detect this PD1+ T cell population in HBV-infected patients on nucleos(t)ide therapy. Citation Information: J Clin Invest. 2018;128(2):577-579. https://doi.org/10.1172/JCI99036. Immune checkpoint inhibitors are becoming a cornerstone of cancer immunotherapy as a result of their clinical success in relieving immune suppression and driving durable antitumor T cell responses in certain subsets of patients. Unfortunately, checkpoint inhibition is also associated with treatment-related toxicities that result in a myriad of side effects, ranging from mild and manageable to severe and debilitating. In this issue of the JCI, Das and colleagues report an association between early therapy-induced changes in circulating B cells and an increased risk of high-grade immune-related adverse events (IRAEs) in patients treated with checkpoint inhibitors that target cytotoxic T lymphocyte–associated antigen-4 (CTLA4) and programmed cell death protein 1 (PD1). These findings identify potential predictive biomarkers for high-grade IRAEs that may be leveraged to improve patient monitoring and may prompt new treatment strategies to prevent IRAEs. Citation Information: J Clin Invest. 2018;128(2):580-588. https://doi.org/10.1172/JCI96061. Citation Information: J Clin Invest. 2018;128(2):589-606. https://doi.org/10.1172/JCI95200. Citation Information: J Clin Invest. 2018;128(2):607-624. https://doi.org/10.1172/JCI95612. Citation Information: J Clin Invest. 2018;128(2):625-643. https://doi.org/10.1172/JCI89212. HIF-1α, one of the most extensively studied oncogenes, is activated by a variety of microenvironmental factors. The resulting biological effects are thought to depend on its transcriptional activity. The RNAse enzyme Dicer is frequently downregulated in human cancers, which has been functionally linked to enhanced metastatic properties; however, current knowledge of the upstream mechanisms regulating Dicer is limited. In the present study, we identified Dicer as a HIF-1α–interacting protein in multiple types of cancer cell lines and different human tumors. HIF-1α downregulated Dicer expression by facilitating its ubiquitination by the E3 ligase Parkin, thereby enhancing autophagy-mediated degradation of Dicer, which further suppressed the maturation of known tumor suppressors, such as the microRNA let-7 and microRNA-200b. Consequently, expression of HIF-1α facilitated epithelial-mesenchymal transition (EMT) and metastasis in tumor-bearing mice. Thus, this study uncovered a connection between oncogenic HIF-1α and the tumor-suppressive Dicer. This function of HIF-1α is transcription independent and occurs through previously unrecognized protein interaction–mediated ubiquitination and autophagic proteolysis. Citation Information: J Clin Invest. 2018;128(2):644-654. https://doi.org/10.1172/JCI94586. Blockade of the checkpoint inhibitor programmed death 1 (PD1) has demonstrated remarkable success in the clinic for the treatment of cancer; however, a majority of tumors are resistant to anti-PD1 monotherapy. Numerous ongoing clinical combination therapy studies will likely reveal additional therapeutics that complement anti-PD1 blockade. Recent studies found that immunogenic cell death (ICD) improves T cell responses against different tumors, thus indicating that ICD may further augment antitumor immunity elicited by anti-PD1. Here, we observed antitumor activity following combinatorial therapy with anti-PD1 Ab and the cyclin-dependent kinase inhibitor dinaciclib in immunocompetent mouse tumor models. Dinaciclib induced a type I IFN gene signature within the tumor, leading us to hypothesize that dinaciclib potentiates the effects of anti-PD1 by eliciting ICD. Indeed, tumor cells treated with dinaciclib showed the hallmarks of ICD including surface calreticulin expression and release of high mobility group box 1 (HMGB1) and ATP. Mice treated with both anti-PD1 and dinaciclib showed increased T cell infiltration and DC activation within the tumor, indicating that this combination improves the overall quality of the immune response generated. These findings identify a potential mechanism for the observed benefit of combining dinaciclib and anti-PD1, in which dinaciclib induces ICD, thereby converting the tumor cell into an endogenous vaccine and boosting the effects of anti-PD1. Citation Information: J Clin Invest. 2018;128(2):668-681. https://doi.org/10.1172/JCI92812. Citation Information: J Clin Invest. 2018;128(2):682-698. https://doi.org/10.1172/JCI85210. Islet amyloidosis is characterized by the aberrant accumulation of islet amyloid polypeptide (IAPP) in pancreatic islets, resulting in β cell toxicity, which exacerbates type 2 diabetes and islet transplant failure. It is not fully clear how IAPP induces cellular stress or how IAPP-induced toxicity can be prevented or treated. We recently defined the properties of toxic IAPP species. Here, we have identified a receptor-mediated mechanism of islet amyloidosis–induced proteotoxicity. In human diabetic pancreas and in cellular and mouse models of islet amyloidosis, increased expression of the receptor for advanced glycation endproducts (RAGE) correlated with human IAPP–induced (h-IAPP–induced) β cell and islet inflammation, toxicity, and apoptosis. RAGE selectively bound toxic intermediates, but not nontoxic forms of h-IAPP, including amyloid fibrils. The isolated extracellular ligand–binding domains of soluble RAGE (sRAGE) blocked both h-IAPP toxicity and amyloid formation. Inhibition of the interaction between h-IAPP and RAGE by sRAGE, RAGE-blocking antibodies, or genetic RAGE deletion protected pancreatic islets, β cells, and smooth muscle cells from h-IAPP–induced inflammation and metabolic dysfunction. sRAGE-treated h-IAPP Tg mice were protected from amyloid deposition, loss of β cell area, β cell inflammation, stress, apoptosis, and glucose intolerance. These findings establish RAGE as a mediator of IAPP-induced toxicity and suggest that targeting the IAPP/RAGE axis is a potential strategy to mitigate this source of β cell dysfunction in metabolic disease. Citation Information: J Clin Invest. 2018;128(2):699-714. https://doi.org/10.1172/JCI94053. Before insulin can stimulate myocytes to take up glucose, it must first move from the circulation to the interstitial space. The continuous endothelium of skeletal muscle (SkM) capillaries restricts insulin’s access to myocytes. The mechanism by which insulin crosses this continuous endothelium is critical to understand insulin action and insulin resistance; however, methodological obstacles have limited understanding of endothelial insulin transport in vivo. Here, we present an intravital microscopy technique to measure the rate of insulin efflux across the endothelium of SkM capillaries. This method involves development of a fully bioactive, fluorescent insulin probe, a gastrocnemius preparation for intravital microscopy, an automated vascular segmentation algorithm, and the use of mathematical models to estimate endothelial transport parameters. We combined direct visualization of insulin efflux from SkM capillaries with modeling of insulin efflux kinetics to identify fluid-phase transport as the major mode of transendothelial insulin efflux in mice. Model-independent experiments demonstrating that insulin movement is neither saturable nor affected by insulin receptor antagonism supported this result. Our finding that insulin enters the SkM interstitium by fluid-phase transport may have implications in the pathophysiology of SkM insulin resistance as well as in the treatment of diabetes with various insulin analogs. Citation Information: J Clin Invest. 2018;128(2):715-720. https://doi.org/10.1172/JCI96798. Combination checkpoint blockade (CCB) targeting inhibitory CTLA4 and PD1 receptors holds promise for cancer therapy. Immune-related adverse events (IRAEs) remain a major obstacle for the optimal application of CCB in cancer. Here, we analyzed B cell changes in patients with melanoma following treatment with either anti-CTLA4 or anti-PD1, or in combination. CCB therapy led to changes in circulating B cells that were detectable after the first cycle of therapy and characterized by a decline in circulating B cells and an increase in CD21lo B cells and plasmablasts. PD1 expression was higher in the CD21lo B cells, and B cell receptor sequencing of these cells demonstrated greater clonality and a higher frequency of clones compared with CD21hi cells. CCB induced proliferation in the CD21lo compartment, and single-cell RNA sequencing identified B cell activation in cells with genomic profiles of CD21lo B cells in vivo. Increased clonality of circulating B cells following CCB occurred in some patients. Treatment-induced changes in B cells preceded and correlated with both the frequency and timing of IRAEs. Patients with early B cell changes experienced higher rates of grade 3 or higher IRAEs 6 months after CCB. Thus, early changes in B cells following CCB may identify patients who are at increased risk of IRAEs, and preemptive strategies targeting B cells may reduce toxicities in these patients. Citation Information: J Clin Invest. 2018;128(2):721-733. https://doi.org/10.1172/JCI96957. Citation Information: J Clin Invest. 2018;128(2):734-745. https://doi.org/10.1172/JCI97032. Citation Information: J Clin Invest. 2018;128(2):774-788. https://doi.org/10.1172/JCI95795. Parkinson’s disease is characterized by the loss of dopamine (DA) neurons in the substantia nigra pars compacta (SNc). DA neurons in the ventral tegmental area are more resistant to this degeneration than those in the SNc, though the mechanisms for selective resistance or vulnerability remain poorly understood. A key to elucidating these processes may lie within the subset of DA neurons that corelease glutamate and express the vesicular glutamate transporter VGLUT2. Here, we addressed the potential relationship between VGLUT expression and DA neuronal vulnerability by overexpressing VGLUT in DA neurons of flies and mice. In Drosophila, VGLUT overexpression led to loss of select DA neuron populations. Similarly, expression of VGLUT2 specifically in murine SNc DA neurons led to neuronal loss and Parkinsonian behaviors. Other neuronal cell types showed no such sensitivity, suggesting that DA neurons are distinctively vulnerable to VGLUT2 expression. Additionally, most DA neurons expressed VGLUT2 during development, and coexpression of VGLUT2 with DA markers increased following injury in the adult. Finally, conditional deletion of VGLUT2 made DA neurons more susceptible to Parkinsonian neurotoxins. These data suggest that the balance of VGLUT2 expression is a crucial determinant of DA neuron survival. Ultimately, manipulation of this VGLUT2-dependent process may represent an avenue for therapeutic development. Citation Information: J Clin Invest. 2018;128(2):789-804. https://doi.org/10.1172/JCI94516. Patients with myeloproliferative neoplasms (MPNs) frequently progress to bone marrow failure or acute myeloid leukemia (AML), and mutations in epigenetic regulators such as the metabolic enzyme isocitrate dehydrogenase (IDH) are associated with poor outcomes. Here, we showed that combined expression of Jak2V617F and mutant IDH1R132H or Idh2R140Q induces MPN progression, alters stem/progenitor cell function, and impairs differentiation in mice. Jak2V617F Idh2R140Q–mutant MPNs were sensitive to small-molecule inhibition of IDH. Combined inhibition of JAK2 and IDH2 normalized the stem and progenitor cell compartments in the murine model and reduced disease burden to a greater extent than was seen with JAK inhibition alone. In addition, combined JAK2 and IDH2 inhibitor treatment also reversed aberrant gene expression in MPN stem cells and reversed the metabolite perturbations induced by concurrent JAK2 and IDH2 mutations. Combined JAK2 and IDH2 inhibitor therapy also showed cooperative efficacy in cells from MPN patients with both JAK2mut and IDH2mut mutations. Taken together, these data suggest that combined JAK and IDH inhibition may offer a therapeutic advantage in this high-risk MPN subtype. Citation Information: J Clin Invest. 2018;128(2):805-815. https://doi.org/10.1172/JCI96113. Citation Information: J Clin Invest. 2018;128(2):816-825. https://doi.org/10.1172/JCI96160. Paclitaxel is among the most widely used anticancer drugs and is known to cause a dose-limiting peripheral neurotoxicity, the initiating mechanisms of which remain unknown. Here, we identified the murine solute carrier organic anion–transporting polypeptide B2 (OATP1B2) as a mediator of paclitaxel-induced neurotoxicity. Additionally, using established tests to assess acute and chronic paclitaxel-induced neurotoxicity, we found that genetic or pharmacologic knockout of OATP1B2 protected mice from mechanically induced allodynia, thermal hyperalgesia, and changes in digital maximal action potential amplitudes. The function of this transport system was inhibited by the tyrosine kinase inhibitor nilotinib through a noncompetitive mechanism, without compromising the anticancer properties of paclitaxel. Collectively, our findings reveal a pathway that explains the fundamental basis of paclitaxel-induced neurotoxicity, with potential implications for its therapeutic management. Citation Information: J Clin Invest. 2018;128(2):834-845. https://doi.org/10.1172/JCI94674. Citation Information: J Clin Invest. 2018;128(2):861-875. https://doi.org/10.1172/JCI96218. The prognosis for bladder cancer patients with lymph node (LN) metastasis is dismal and only minimally improved by current treatment modalities. Elucidation of the molecular mechanisms that underlie LN metastasis may provide clinical therapeutic strategies for LN-metastatic bladder cancer. Here, we report that a long noncoding RNA LINC00958, which we have termed bladder cancer–associated transcript 2 (BLACAT2), was markedly upregulated in LN-metastatic bladder cancer and correlated with LN metastasis. Overexpression of BLACAT2 promoted bladder cancer–associated lymphangiogenesis and lymphatic metastasis in both cultured bladder cancer cell lines and mouse models. Furthermore, we demonstrate that BLACAT2 epigenetically upregulated VEGF-C expression by directly associating with WDR5, a core subunit of human H3K4 methyltransferase complexes. Importantly, administration of an anti–VEGF-C antibody inhibited LN metastasis in BLACAT2-overexpressing bladder cancer. Taken together, these findings uncover a molecular mechanism in the lymphatic metastasis of bladder cancer and indicate that BLACAT2 may represent a target for clinical intervention in LN-metastatic bladder cancer.